It is winter. It is cold and extraordinarily windy today. 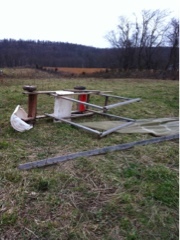 The world didn't end yesterday, but the wind is breaking up plenty of the things we own and use on the farm. When people wonder what we do in the wintertime: besides growing eggs, beef, pork, vegetables and a dairy cow, the answer is always the same. Repairs. To all sorts of things. This repair did not need to be done yesterday. Yesterday it was intact. But today the cow shade, mobile, is in pieces. At this time of year the cows don't really need it. So it is added to the work list.